Azure DevTest Labs lets you control cost and minimizes waste in your labs by managing policies (settings) for each lab. This article explains in step-by-step detail how to set each policy. The policy for setting the allowed VM sizes helps to minimize lab waste by enabling you to specify which VM sizes are allowed in the lab. If this policy is activated, only VM sizes from this list can be used to create VMs. In the Azure portal, select a lab and then select Configuration and policies. On the lab's Configuration and policies pane, select Allowed virtual machines sizes. If you enable this policy, select one or more VM sizes that can be created in your lab. The policy for Virtual machines per user lets you specify the number of VMs that can be created by an individual user. If a user tries to create or claim a VM when the user limit has been met, an error message indicates that the VM cannot be created/claimed. On the lab's Configuration and policies pane, select Virtual machines per user. Select Yes to limit the number of VMs per user. If you do not want to limit the number of VMs per user, select No. If you select Yes, enter a numeric value indicating the number of VMs that can be created or claimed by a user. Select Yes to limit the number of VMs that can use SSD (solid-state disk). If you do not want to limit the number of VMs that can use SSD, select No. If you select Yes, enter a value indicating the number of VMs that can be created using SSD. 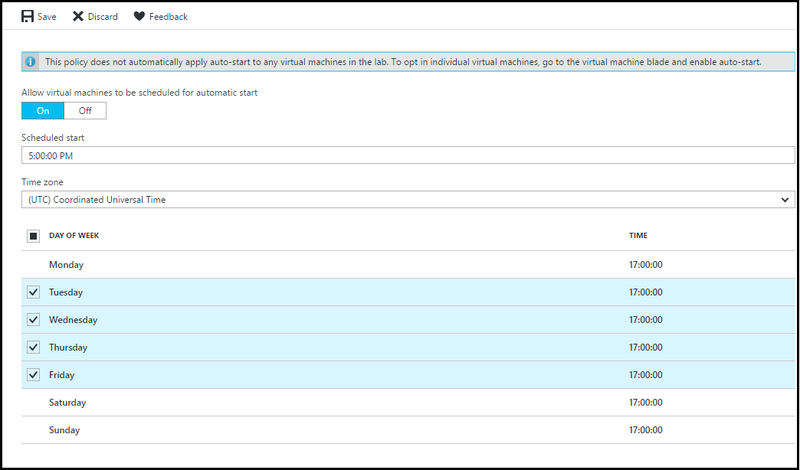 The policy for Virtual machines per lab lets you specify the number of VMs that can be created for the current lab. If a user tries to create a VM when the lab limit has been met, an error message indicates that the VM cannot be created. 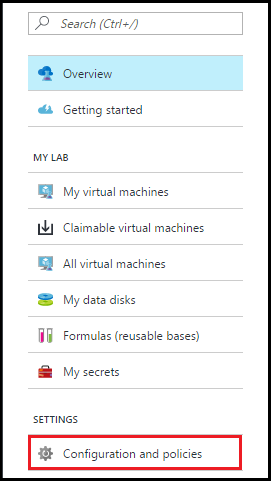 On the lab's Configuration and policies pane, select Virtual machines per lab. 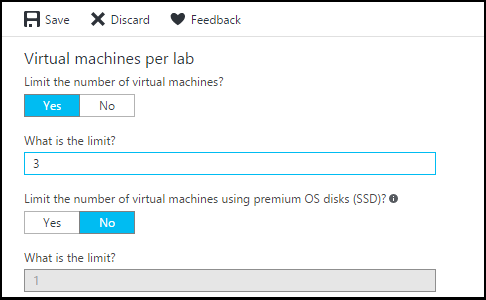 Select Yes to limit the number of VMs per lab. If you do not want to limit the number of VMs per lab, select No. If you select Yes, enter a numeric value indicating the number of VMs that can be created or claimed by a user. The auto shutdown policy helps minimize lab waste by letting you specify the time that this lab's VMs shut down. 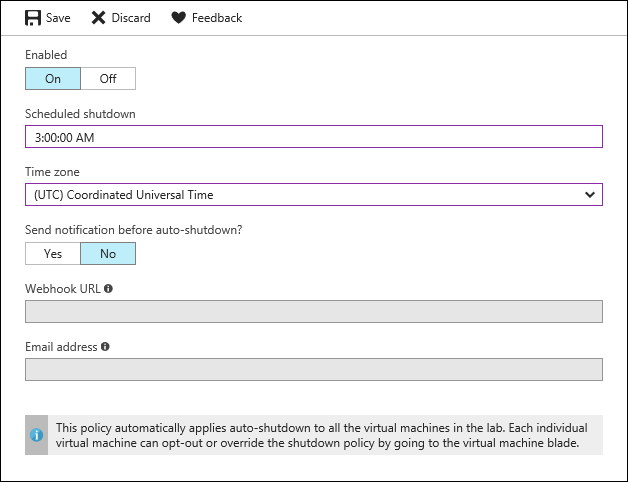 On the lab's Configuration and policies pane, select Auto shutdown. Specify Yes or No for the option to send a notification 15 minutes before the specified auto shutdown time. If you choose Yes, enter a webhook URL endpoint or an email address specifying where you want the notification to be posted or sent. The user receives notification and is given the option to postpone the shutdown. By default, once enabled, this policy applies to all VMs in the current lab. To remove this setting from a specific VM, open the VM's management pane and change its Auto shutdown setting. On the home page for your lab, select Configuration and policies. Select Auto shutdown policy in the Schedules section of the left menu. Select one of the options. The following sections give you more details about these options: The set policy applies only to new VMs created in the lab and not to the already existing VMs. If you set your lab to this policy, the lab users can override or opt out of the lab schedule. This option grants lab users full control over auto shutdown schedule of their VMs. Lab users see no change in their VM auto shutdown schedule page. If you set your lab to this policy, lab users can override the lab schedule. However, they can't opt out of auto shutdown policy. This option makes sure that every machine in your lab is under an auto shutdown schedule. Lab users can update auto shutdown schedule of their VMs, and set up shut down notifications. If you set your lab to this policy, lab users can't override or opt out of the lab schedule. This option offers lab admin the complete control on the schedule for every machine in the lab. Lab users can only set up auto shutdown notifications for their VMs. The autostart policy lets you specify when the VMs in the current lab should be started. On the lab's Configuration and policies pane, select Autostart. Once enabled, this policy is not automatically applied to any VMs in the current lab. To apply this setting to a specific VM, open the VM's management pane and change its Autostart setting. You can set an expiration date when you create the VM. In Advanced settings, choose the calendar icon to specify a date on which the VM is automatically deleted. By default, the VM never expires. Understand shared IP addresses - Explains how shared IP addresses are used in DevTest Labs to minimize the number of public IP addresses required to connect to your lab VMs. to view the current month's estimated cost-to-date and the projected end-of-month cost. Create custom image - When you create a VM, you specify a base, which can be either a custom image or a Marketplace image. This article illustrates how to create a custom image from a VHD file. Configure Marketplace images - Azure DevTest Labs supports creating VMs based on Azure Marketplace images. This article illustrates how to specify which, if any, Azure Marketplace images can be used when creating VMs in a lab. Create a VM in a lab - Illustrates how to create a VM from a base image (either custom or Marketplace), and how to work with artifacts in your VM.